Provides a consistent programming model across different transaction APIs such as JTA, JDBC, Hibernate, JPA, and JDO. Provides a simpler API for programmatic transaction management than a number of complex transaction APIs such as JTA. Integrates very well with Spring's various data access abstractions. This chapter is divided up into a number of sections, each detailing one of the value-adds or technologies of the Spring Framework's transaction support. The chapter closes up with some discussion of best practices surrounding transaction management (for example, choosing between declarative and programmatic transaction management). The first section, entitled Motivations, describes why one would want to use the Spring Framework's transaction abstraction as opposed to EJB CMT or driving transactions via a proprietary API such as Hibernate. The second section, entitled Key abstractions outlines the core classes in the Spring Framework's transaction support, as well as how to configure and obtain DataSource instances from a variety of sources. The third section, entitled Declarative transaction management, covers the Spring Framework's support for declarative transaction management. The fourth section, entitled Programmatic transaction management, covers the Spring Framework's support for programmatic (that is, explicitly coded) transaction management. Is an application server needed for transaction management? The Spring Framework's transaction management support significantly changes traditional thinking as to when a J2EE application requires an application server. In particular, you don't need an application server just to have declarative transactions via EJB. In fact, even if you have an application server with powerful JTA capabilities, you may well decide that the Spring Framework's declarative transactions offer more power and a much more productive programming model than EJB CMT. The most important point is that with the Spring Framework you can choose when to scale your application up to a full-blown application server. Gone are the days when the only alternative to using EJB CMT or JTA was to write code using local transactions such as those on JDBC connections, and face a hefty rework if you ever needed that code to run within global, container-managed transactions. With the Spring Framework, only configuration needs to change so that your code doesn't have to. Global Transactions. Global transactions have a significant downside, in that code needs to use JTA, and JTA is a cumbersome API to use (partly due to its exception model). Furthermore, a JTA UserTransaction normally needs to be sourced from JNDI: meaning that we need to use both JNDI and JTA to use JTA. Obviously all use of global transactions limits the reusability of application code, as JTA is normally only available in an application server environment. Previously, the preferred way to use global transactions was via EJB CMT (Container Managed Transaction): CMT is a form of declarative transaction management (as distinguished from programmatic transaction management). EJB CMT removes the need for transaction-related JNDI lookups - although of course the use of EJB itself necessitates the use of JNDI. It removes most of the need (although not entirely) to write Java code to control transactions. The significant downside is that CMT is tied to JTA and an application server environment. Also, it is only available if one chooses to implement business logic in EJBs, or at least behind a transactional EJB facade. The negatives around EJB in general are so great that this is not an attractive proposition, especially in the face of compelling alternatives for declarative transaction management. Local Transactions. Local transactions may be easier to use, but have significant disadvantages: they cannot work across multiple transactional resources. For example, code that manages transactions using a JDBC connection cannot run within a global JTA transaction. Another downside is that local transactions tend to be invasive to the programming model. Spring resolves these problems. It enables application developers to use a consistent programming model in any environment. You write your code once, and it can benefit from different transaction management strategies in different environments. The Spring Framework provides both declarative and programmatic transaction management. Declarative transaction management is preferred by most users, and is recommended in most cases. With programmatic transaction management, developers work with the Spring Framework transaction abstraction, which can run over any underlying transaction infrastructure. With the preferred declarative model, developers typically write little or no code related to transaction management, and hence don't depend on the Spring Framework's transaction API (or indeed on any other transaction API). This is primarily an SPI interface, although it can be used programmatically. Note that in keeping with the Spring Framework's philosophy, PlatformTransactionManager is an interface, and can thus be easily mocked or stubbed as necessary. Nor is it tied to a lookup strategy such as JNDI: PlatformTransactionManager implementations are defined like any other object (or bean) in the Spring Framework's IoC container. This benefit alone makes it a worthwhile abstraction even when working with JTA: transactional code can be tested much more easily than if it used JTA directly. Again in keeping with Spring's philosophy, the TransactionException that can be thrown by any of the PlatformTransactionManager interface's methods is unchecked (i.e. it extends the java.lang.RuntimeException class). Transaction infrastructure failures are almost invariably fatal. In rare cases where application code can actually recover from a transaction failure, the application developer can still choose to catch and handle TransactionException. The salient point is that developers are not forced to do so. The getTransaction(..) method returns a TransactionStatus object, depending on a TransactionDefinition parameter. The returned TransactionStatus might represent a new or existing transaction (if there were a matching transaction in the current call stack - with the implication being that (as with J2EE transaction contexts) a TransactionStatus is associated with a thread of execution). Propagation: normally all code executed within a transaction scope will run in that transaction. 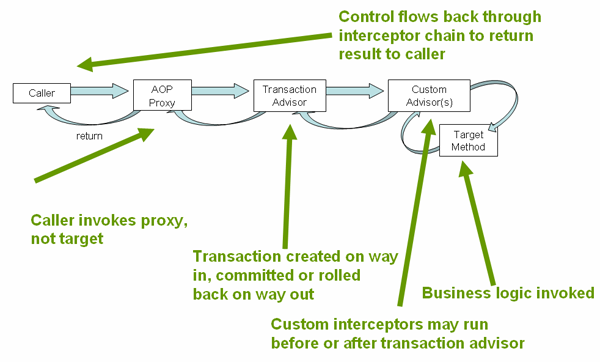 However, there are several options specifying behavior if a transactional method is executed when a transaction context already exists: for example, simply continue running in the existing transaction (the common case); or suspending the existing transaction and creating a new transaction. Spring offers all of the transaction propagation options familiar from EJB CMT. Read-only status: a read-only transaction does not modify any data. Read-only transactions can be a useful optimization in some cases (such as when using Hibernate). Regardless of whether you opt for declarative or programmatic transaction management in Spring, defining the correct PlatformTransactionManager implementation is absolutely essential. In good Spring fashion, this important definition typically is made using via Dependency Injection. We must define a JDBC DataSource, and then use the Spring DataSourceTransactionManager, giving it a reference to the DataSource. If we use JTA in a J2EE container, as in the 'dataAccessContext-jta.xml' file from the same sample application, we use a container DataSource, obtained via JNDI, in conjunction with Spring's JtaTransactionManager. The JtaTransactionManager doesn't need to know about the DataSource, or any other specific resources, as it will use the container's global transaction management infrastructure. The above definition of the 'dataSource' bean uses the <jndi-lookup/> tag from the 'jee' namespace. For more information on schema-based configuration, see Appendix A, XML Schema-based configuration, and for more information on the <jee/> tags see the section entitled Section A.2.3, “The jee schema”. We can also use Hibernate local transactions easily, as shown in the following examples from the Spring Framework's PetClinic sample application. In this case, we need to define a Hibernate LocalSessionFactoryBean, which application code will use to obtain Hibernate Session instances. The DataSource bean definition will be similar to the one shown previously (and thus is not shown). If the DataSource is managed by the JEE container it should be non-transactional as the Spring Framework, rather than the JEE container, will manage transactions. The 'txManager' bean in this case is of the HibernateTransactionManager type. In the same way as the DataSourceTransactionManager needs a reference to the DataSource, the HibernateTransactionManager needs a reference to the SessionFactory. With Hibernate and JTA transactions, we can simply use the JtaTransactionManager as with JDBC or any other resource strategy. Note that this is identical to JTA configuration for any resource, as these are global transactions, which can enlist any transactional resource. In all these cases, application code will not need to change at all. We can change how transactions are managed merely by changing configuration, even if that change means moving from local to global transactions or vice versa. It should now be clear how different transaction managers are created, and how they are linked to related resources which need to be synchronized to transactions (i.e. DataSourceTransactionManager to a JDBC DataSource, HibernateTransactionManager to a Hibernate SessionFactory, etc). There remains the question however of how the application code, directly or indirectly using a persistence API (JDBC, Hibernate, JDO, etc), ensures that these resources are obtained and handled properly in terms of proper creation/reuse/cleanup and trigger (optionally) transaction synchronization via the relevant PlatformTransactionManager. The preferred approach is to use Spring's highest level persistence integration APIs. These do not replace the native APIs, but internally handle resource creation/reuse, cleanup, optional transaction synchronization of the resources and exception mapping so that user data access code doesn't have to worry about these concerns at all, but can concentrate purely on non-boilerplate persistence logic. Generally, the same template approach is used for all persistence APIs, with examples including the JdbcTemplate, HibernateTemplate, and JdoTemplate classes (detailed in subsequent chapters of this reference documentation. At a lower level exist classes such as DataSourceUtils (for JDBC), SessionFactoryUtils (for Hibernate), PersistenceManagerFactoryUtils (for JDO), and so on. When it is preferable for application code to deal directly with the resource types of the native persistence APIs, these classes ensure that proper Spring Framework-managed instances are obtained, transactions are (optionally) synchronized, and exceptions which happen in the process are properly mapped to a consistent API. If an existing transaction exists, and already has a connection synchronized (linked) to it, that instance will be returned. Otherwise, the method call will trigger the creation of a new connection, which will be (optionally) synchronized to any existing transaction, and made available for subsequent reuse in that same transaction. As mentioned, this has the added advantage that any SQLException will be wrapped in a Spring Framework CannotGetJdbcConnectionException - one of the Spring Framework's hierarchy of unchecked DataAccessExceptions. This gives you more information than can easily be obtained from the SQLException, and ensures portability across databases: even across different persistence technologies. It should be noted that this will also work fine without Spring transaction management (transaction synchronization is optional), so you can use it whether or not you are using Spring for transaction management. Of course, once you've used Spring's JDBC support or Hibernate support, you will generally prefer not to use DataSourceUtils or the other helper classes, because you'll be much happier working via the Spring abstraction than directly with the relevant APIs. For example, if you use the Spring JdbcTemplate or jdbc.object package to simplify your use of JDBC, correct connection retrieval happens behind the scenes and you won't need to write any special code. At the very lowest level exists the TransactionAwareDataSourceProxy class. This is a proxy for a target DataSource, which wraps the target DataSource to add awareness of Spring-managed transactions. In this respect, it is similar to a transactional JNDI DataSource as provided by a J2EE server. It should almost never be necessary or desirable to use this class, except when existing code exists which must be called and passed a standard JDBC DataSource interface implementation. In that case, it's possible to still have this code be usable, but participating in Spring managed transactions. It is preferable to write your new code using the higher level abstractions mentioned above. The Spring Framework offers declarative rollback rules: a feature with no EJB equivalent, which we'll discuss below. Rollback can be controlled declaratively, not merely programmatically. The Spring Framework does not support propagation of transaction contexts across remote calls, as do high-end application servers. If you need this feature, we recommend that you use EJB. However, consider carefully before using such a feature. Normally, we do not want transactions to span remote calls. The old, pre-Spring 2.0 configuration style is still 100% valid configuration; under the covers think of the new <tx:tags/> as simply defining TransactionProxyFactoryBean beans on your behalf. While the EJB default behavior is for the EJB container to automatically roll back the transaction on a system exception (usually a runtime exception), EJB CMT does not roll back the transaction automatically on an application exception (i.e. a checked exception other than java.rmi.RemoteException). While the Spring default behavior for declarative transaction management follows EJB convention (roll back is automatic only on unchecked exceptions), it is often useful to customize this. Looking at the Spring Framework source code is a good way to get a real understanding of the transaction support. We also suggest turning the logging level to 'DEBUG' during development to better see what goes on under the hood. Although knowledge of Spring AOP is not required to use Spring's declarative transaction support, it can help. Spring AOP is thoroughly covered in the chapter entitled Chapter 6, Aspect Oriented Programming with Spring. The expression defined within the <aop:pointcut/> element is an AspectJ pointcut expression; see the chapter entitled Chapter 6, Aspect Oriented Programming with Spring for more details on pointcut expressions in Spring 2.0. However, please note that the Spring Framework's transaction infrastructure code will, by default, only mark a transaction for rollback in the case of runtime, unchecked exceptions; that is, when the thrown exception is an instance or subclass of RuntimeException. (Errors will also - by default - result in a rollback.) Checked exceptions that are thrown from a transactional method will not result in the transaction being rolled back. You are strongly encouraged to use the declarative approach to rollback if at all possible. Programmatic rollback is available should you need it, but its usage flies in the face of achieving a clean POJO-based application model. The method name(s) with which the transaction attributes are to be associated. The wildcard (*) character can be used to associate the same transaction attribute settings with a number of methods; for example, 'get*', 'handle*', 'on*Event', etc. At the time of writing it is not possible to have explicit control over the name of a transaction, where 'name' means the transaction name that will be shown in a transaction monitor, if applicable (for example, WebLogic's transaction monitor), and in logging output. For declarative transactions, the transaction name is always the fully-qualified class name + "." + method name of the transactionally-advised class. For example 'com.foo.BusinessService.handlePayment'. The functionality offered by the @Transactional annotation and the support classes is only available to you if you are using Java 5+. The Spring team's recommendation is that you only annotate concrete classes with the @Transactional annotation, as opposed to annotating interfaces. You certainly can place the @Transactional annotation on an interface (or an interface method), but this will only work as you would expect it to if you are using interface-based proxies. The fact that annotations are not inherited means that if you are using class-based proxies then the transaction settings will not be recognised by the class-based proxying infrastructure and the object will not be wrapped in a transactional proxy (which would be decidedly bad). So please do take the Spring team's advice and only annotate concrete classes (and the methods of concrete classes) with the @Transactional annotation. Defines the order of the transaction advice that will be applied to beans annotated with <code>@Transactional</code>. More on the rules related to ordering of AOP advice can be found in the AOP chapter (see section Section 6.2.4.7, “Advice ordering”). Note that not specifying any ordering will leave the decision as to what order advice is run in to the AOP subsystem. Consider the situation where you would like to execute both transactional and (to keep things simple) some basic profiling advice. Hhow do you effect this in the context of using <tx:annotation-driven/>? This chapter is not concerned with explaining AOP in any great detail (except as it applies to transactions). Please see the chapter entitled Chapter 6, Aspect Oriented Programming with Spring for detailed coverage of the various bits and pieces of the following AOP configuration (and AOP in general). Here is the code for a simple profiling aspect. The ordering of advice is controlled via the Ordered interface. For full details on advice ordering, see Section 6.2.4.7, “Advice ordering”. It is also possible to use the Spring Framework's @Transactional support outside of a Spring container by means of an AspectJ aspect. To use this support you must first annotate your classes (and optionally your classes' methods with the @Transactional annotation, and then you must link (weave) your application with the org.springframework.transaction.aspectj.AnnotationTransactionAspect defined in the spring-aspects.jar file. The aspect must also be configured with a transaction manager. You could of course use the Spring Framework's IoC container to take care of dependency injecting the aspect, but since we're focusing here on applications running outside of a Spring container, we'll show you how to do it programmatically. Prior to continuing, you may well want to read the previous sections entitled Section 9.5.6, “Using @Transactional” and Chapter 6, Aspect Oriented Programming with Spring respectively. To weave your applications with the AnnotationTransactionAspect you must either build your application with AspectJ (see the AspectJ Development Guide) or use load-time weaving. See the section entitled Section 6.8.4, “Using AspectJ Load-time weaving (LTW) with Spring applications” for a discussion of load-time weaving with AspectJ. If you are going to use programmatic transaction management, the Spring team generally recommend, namely that of using the TransactionTemplate). The second approach is similar to using the JTA UserTransaction API (although exception handling is less cumbersome). Application code that must execute in a transactional context, and that will use the TransactionTemplate explicitly, looks like this. You, as an application developer, will write a TransactionCallback implementation (typically expressed as an anonymous inner class) that will contain all of the code that you need to have execute in the context of a transaction. You will then pass an instance of your custom TransactionCallback to the execute(..) method exposed on the TransactionTemplate. Code within the callback can roll the transaction back by calling the setRollbackOnly() method on the supplied TransactionStatus object. You can also use the org.springframework.transaction.PlatformTransactionManager directly to manage your transaction. Simply pass the implementation of the PlatformTransactionManager you're using to your bean via a bean reference. Then, using the TransactionDefinition and TransactionStatus objects you can initiate transactions, rollback and commit. Spring's transaction abstraction is generally application server agnostic. Additionally, Spring's JtaTransactionManager class, which can optionally perform a JNDI lookup for the JTA UserTransaction and TransactionManager objects, can be set to autodetect the location for the latter object, which varies by application server. Having access to the TransactionManager instance does allow enhanced transaction semantics. Please see the JtaTransactionManager Javadocs for more details. In a WebLogic 7.0, 8.1 or higher environment, you will generally prefer to use WebLogicJtaTransactionManager instead of the stock JtaTransactionManager class. This special WebLogic-specific subclass of the normal JtaTransactionManager. It supports the full power of Spring's transaction definitions in a WebLogic managed transaction environment, beyond standard JTA semantics: features include transaction names, per-transaction isolation levels, and proper resuming of transactions in all cases. In a WebSphere 5.1, 5.0 and 4 environment, you may wish to use Spring's WebSphereTransactionManagerFactoryBean class. This is a factory bean which retrieves the JTA TransactionManager in a WebSphere environment, which is done via WebSphere's static access methods. (These methods are different for each version of WebSphere.) Once the JTA TransactionManager instance has been obtained via this factory bean, Spring's JtaTransactionManager may be configured with a reference to it, for enhanced transaction semantics over the use of only the JTA UserTransaction object. Please see the Javadocs for full details. You should take care to use the correct PlatformTransactionManager implementation for their requirements. It is important to understand how the the Spring Framework's transaction abstraction works with JTA global transactions. Used properly, there is no conflict here: the Spring Framework merely provides a straightforward and portable abstraction. If you are using global transactions, you must use the org.springframework.transaction.jta.JtaTransactionManager class (or an application server-specific subclass of it) for all your transactional operations. Otherwise the transaction infrastructure will attempt to perform local transactions on resources such as container DataSource instances. Such local transactions don't make sense, and a good application server will treat them as errors. Find below links to further resources about the Spring Framework's transaction support. This book, Java Transaction Design Strategies from InfoQ is a well-paced introduction to transactions in the Java space. It also includes side-by-side examples of how to configure and use transactions in both the Spring Framework and EJB3.